Read a recap of key insights and takeaways taken from the sessions at this year's Forum. The FOX Financial Executives Forum now has a new name: The FOX Family Office Forum. Anyone who has attended recently knows that the scope of the conference expanded beyond only financial executives long ago. The topics and the peer network now include CEOs, HR managers, technology heads, as well as financial executives. Our new name clarifies that this is a gathering for all family office executives. The Forum will cover how families are approaching implementation of the new tax and estate regulations, provide an overview of how families should think about the selection of new technology, include demonstrations by numerous leading technology providers, and offer break-out sessions about creating an effective team in your family office, the various iterations of a virtual office as well as the lessons learned, and considerations for converting business structures. As always, there will be the annual in-person gatherings of the Human Capital and Technology Operations and Data Security Networks. The Forum will be centrally located in Chicago at the Swissotel on July 17-18, 2018. 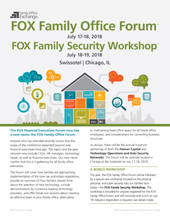 This year, the FOX Family Office Forum will be followed by a special new workshop focused on the physical, personal, and cyber security risks our families face today—the FOX Family Security Workshop. This workshop is included for anyone registered for the FOX Family Office Forum and will conclude with lunch on July 19. Advance registration is required and must be indicated while registering for the Family Office Forum. To register for the Workshop only, please go to the FOX Family Security Workshop page. Field of Study: Finance - Up to 3.5 CPE credits can be earned from the Forum, and up to an additional 7 CPE from the Workshop. CPE credits are accepted at the option of state certifying boards. Requirements, compliance procedures and acceptance may vary by state. Learning Objectives: Upon completion of the program, participants will be able to identify the latest developments and solutions in technology, insurance, taxes, risk, business structures, team building, security, and family office business processes.